My Pedagogic Creed is the "manifesto" of the new schools. By the time a shot was fired in the middle of a swamp pedagogical could not recognize the centrality of the subject in the educational process. Dewey became the theoretical maximum representative of the progressive school. With the new education was occurring a shift of the core around which the educational practices: from the teacher to the child. 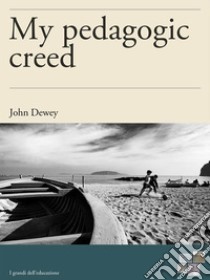 The fundamental point of the analysis of pedagogical Dewey is given by a conception of education as a "social participation of the individual consciousness of the species" that is in the principle of democratic life its highest manifestation and meaningful. If the democratic society is the product of the intelligence of men, in turn, the education of intelligence is a decisive factor for democratic life. The democratic life is nourished, in short, through the cultivation of the intellect. The close relationship between democracy and education is the basis of the interactive relationship between school and society. The school is based on the activities and interests of the pupils, ordered as an open community to social reality, agreed not to mold them in a standardized way, but to value them according to their potential, is referred to as the indispensable condition for the emergence of a society in which humans can experience in a personal way democracy. Dewey writes, "with a top oppose the expression of individuality and culture, the discipline outside the free activity, to learning from books and teachers, the learning through experience; purchase of isolated skills and techniques through exercise opposes the achievement of them as a means to achieve the purpose that meet vital needs, the preparation for a more or less remote future is opposed to the maximum exploitation of the possibilities of the present life to the purposes and opposed to static materials familiarization with a world in motion. " Among these principles, that of learning through experience (learning by doing) occupies a central place in the reflection of the author. The experience is the starting point of all knowledge and all educational practice. The experience for Dewey denotes everything that is experienced, everything that happens in the world, everything you try and you suffer, it is a a reality that includes everything: includes what is rational and logical as that which is irrational and unconscious.